It’s time again to join in on the fun and clear my conscious of recent running, biking, fitness, and nutrition related faux pas. I know I’ll feel better when I’m done! 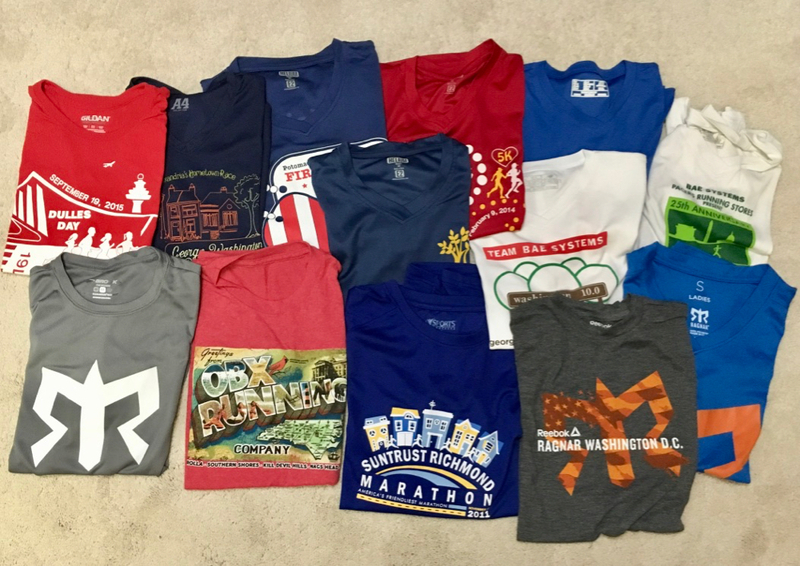 I runfess: I’m considering throwing out most of my old race shirts that I rarely wear or haven’t worn for years and put an end to my hoarding ways. Of course, the older ones certainly came in handy while writing my throwback race recaps! A part of me thinks that I should save them for a quilt, but after all of that work making it, would I really ever use it? I runfess: I hinted to my son that I’d love a Boston Marathon race course pint glass for Christmas, but I don’t drink beer (modern day hints include texting a link). He took the hint and bought it for me. Guess my margaritas will be a little larger from now on! I runfess: On the morning of New Year’s Day, my car was at the dealer getting its oil changed so I had to drive Bill’s car to my race. I grabbed my key fob, but the battery in it was dead (I rarely drive his car) so I ran back into the house to get Bill’s. The car said something like it didn’t recognize the key. I freaked out that I was going to be late getting to the race (I had plenty of time) and ran back inside to get Bill to come help me. By the time he’d gotten to the garage I was back in the car, trying to start it again. Turns out, I’d grabbed his key fob for my car, not his key for his car. What a nincompoop! I runfess: I haven’t run since New Year’s Day, but not because of lack of motivation. I’m hoping to get answers later this morning as to why I’ve had this nagging injury resulting in deep glute and hamstring sciatic nerve pain since the third mile of my Thanksgiving Day turkey trot. I runfess: I still haven’t made anything from my Run Fast. Eat Slow (affiliate link) cookbook by Shalane Flanagan and Elyse Kopecky; and I’m going to keep runfessing this until I embarrass myself to the point of making something… anything! I gymfess: Recently at a gym, I saw a ziplock bag full of earbuds with a note taped to it saying, “Loaner Ear Buds – Please Wipe Off After Use.” My first reaction was ewww, but then I remembered that you used to be able to rent earphones on planes for watching movies, but then I remembered that they had foamy things that fit on the outside of your ears, not in them… I’m trying not to be judgy, but ewww! I bikefess: I ordered rechargeable biking gloves from a Facebook ad because the fingers are also warmed, something I can’t get with hand warmers. The gloves took about six weeks to get here and they’re not rechargable in the sense that I can plug them into a mini USB port and recharge them like my headlamp (affiliate link). Nope, each glove requires three AA batteries to operate. 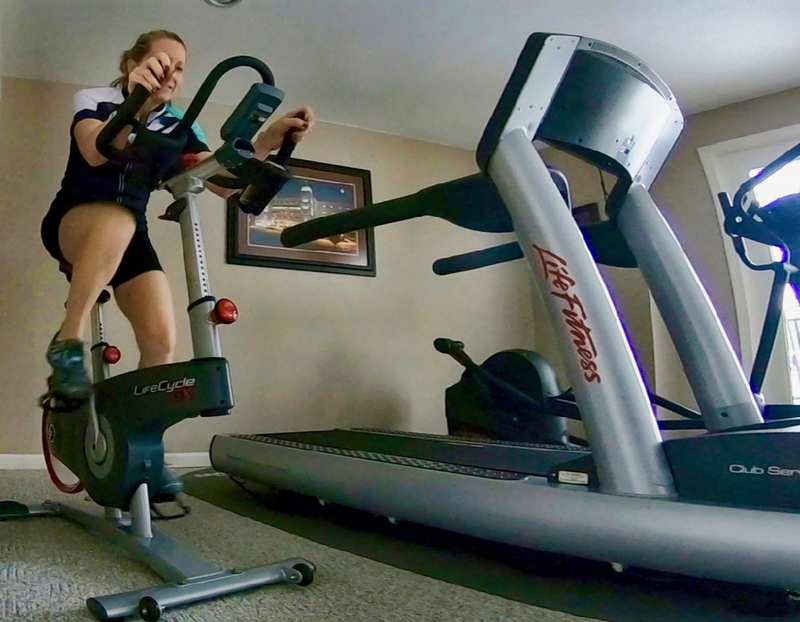 I bikefess: I’ve not been very good at riding my indoor bike (affiliate link) this winter, but I’ve actually ridden it three times this weeks, so there’s that! There you have it, my most recent runfessions. Ahhh yes, it feels good to get another set off of my chest. See you next month in the runfessional. Have you ordered anything from a Facebook ad? Do you like beer? Margaritas? Today I’m linking up with Marcia at Marcia’s Healthy Slice for her monthly Runfessions linkup. Be sure to check out her blog and those of the other great bloggers linking up. I got a Philly Marathon pint glass as a gift and I LOVE it! It’s perfect for water, too. I don’t think I’ve ever thrown away a race shirt…which means I have a huge stash in my attic. Oh boy! Every race has sentimental value so the struggle is real! My little patients always want to try my stethoscope and I’m like ewwww. I sometimes let them, but It’s a little disturbing. I’m pretty sure the parents would complain if I used the same ear tip on the otoscope for everyone! But this doesn’t seem to bother them. I hope you get answers to your injury too! Oh yeah, I hadn’t thought of the little ones wanting to use your stethoscope. And thanks, my apt went well yesterday and I have a plan now! I’ll go into detail in my weekly wrap tomorrow. I use my pint glasses (which I love) for smoothies — I don’t drink. I do have a stash of old race shirts I no longer wear — not quite sure what to do with them. Don’t even get me on senior moments (or always forgetting to grab my keys when I “leave”). Drinking your smoothies from a pint glass sounds like a great way to emphasize the importance of your nutrition and training runs. Good training + good nutrition = a good race (hopefully). I did make a quilt out of my old t shirts and it’s nice to use to cozy up on the couch. Not sure I would make a second one though. ha ha on the keys! Yeah, I was pretty embarrassed about the keys. Fortunately, Bill didn’t make a big deal out of it. Do you have a link to a post or picture of your quilt? I’d love to see it for an idea on the style and size to cut the squares. I instantly also said “Eww” when I read loaner ear buds! While I only workout with music, I think I could make it through a workout without music to avoid using previously used earbuds! Cool, here’s a toast to happy running for us both – clink! I runfess I collect race pint glasses…and have never had more than a sip of beer. And now I NEED that Boston one! I made one thing from RFES. At least a year ago. And that’s it. Thanks for linking! I ordered a cute pair of booties from an Insta ad (which I’ve also seen on FB)…said booties still have not arrived. The tracking log shows they have made three different destination check points, each one requiring a good 2-day turn-around before they head to the next one. Nice, huh! My gloves were apparently on a slow boat from China and took about six or seven weeks to arrive. I was starting to think “I’d been had.” Hope your booties arrive soon and that you like them! I ordered a tote bag that looks like Pablo from Facebook for my son’s girlfriend and it looks just like him! It took forever to get here as well, but it turned out great! I’m thinking of the qullt too, but I have so many blankets! Yes, you’re correct, those batteries add noticeable weight! So the earbud thing sounds creepy AF…I don’t think I would ever do that! I love the cookbook- you should definitely make something! I have tried multiple recipes and *most* have turned out really good! And I feel more full and like I’m eating better when I cook from it. I have both of her cookbooks. I hope you figure out this injury thing. I hate not knowing what’s going on with my body. I made one of those race t shirt quilt things and my cat commandeered it. So I don’t use it much but he does. I’m glad to hear that you’ve used the cookbook. I need to be inspired from someone who uses it!